I made this open-faced version of “Beach Club” after a very exciting trip to Whole Foods. I went there about two weeks ago, there was a ton of local produce all at a really good price. Summer is a great time to buy organic and local because you usually find it really affordable. As usual I was craving avocados so I bought the ingredients to make my guacamole and purchased some beautiful tomato and cucumber as well. I got home and made this for an afternoon snack. It tasted so good, I made it the next day and the day after that, and now I think it will be in the regular rotation of lunches and snacks I have. I know I eat a lot of avocados and some people are really worried about their high fat content, remember 2/3 of the fats from avocado are monounsaturated-fat which means they are the good, heart healthy fats. They do have a high calorie count so if you are trying to lose weight then I wouldn’t eat 3 a day, but you can include them in your diet and still be successful in losing weight, just eat them in moderation. I hope you enjoy this open-faced sandwich as much as I did, it’s very refreshing for the summertime. If you are having it as lunch I would add some sliced fruit or a side salad to help fill you up for the afternoon! 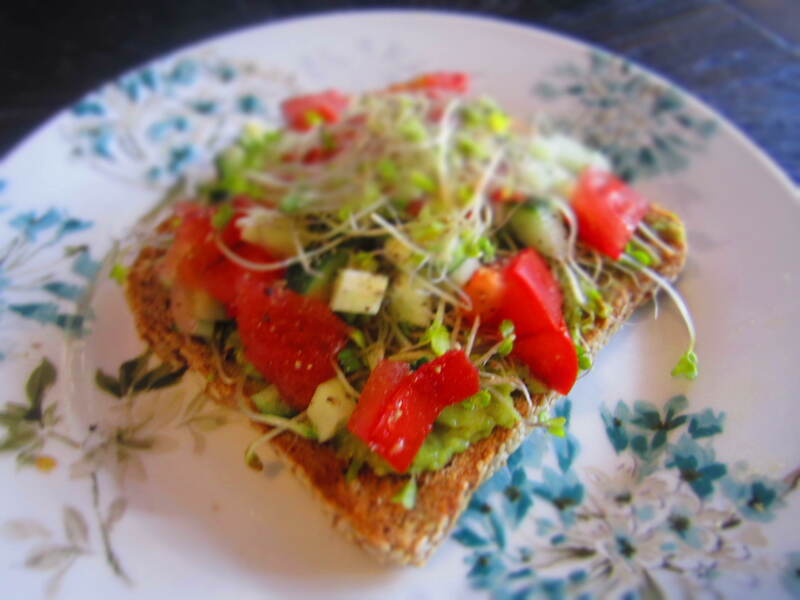 Add chopped tomato and cucumber onto guacamole or avocado, then pile sprouts on top. Season with a little salt and pepper and enjoy!